Filled with lush jungles, waterfalls, and amazing flora and fauna, Coats Rica is magnet for the outdoors and outdoor living. The food is exceptionally fresh and tasty, the people warm, friendly, and inviting. Exploring this nation feels like your on an expedition into a long lost world! Costa Rica is a wonderful country, chalked full of adventure opportunities from zip lines to surfing, snorkeling to hiking volcanoes. And as an added bonus, most activities you can do anywhere in the country, so don’t worry about having to traverse this nation to find adventure. Here’s your guide to finding adventure in Costa Rica! One of the most popular activities in Costa Rica, and literally available anywhere and everywhere, zip-lining is a great way to start your trip! I went zip lining with the company Selvatura in Monteverde Cloud Forest Reserve, which was an amazing experience. Not only did I get to zip line through the jungle canopy of a cloud forest, I also got to take a tandem 1 km long zip line high ABOVE the jungle canopy over a valley! This was a fantastic way to get my feet wet and experience the Costa Rican jungle up close. Zip-lines above the jungle canopy. Selvatura was a wonderful company who also offered many other activities on site. I opted for the full day package, where I got to go zip lining, hike through tree top walkways, visit a hummingbird garden and walk through the Reptile and Amphibian house, with lunch included. Another fun way to explore the jungle! While in the town of La Fortuna, I did just this with Pure Trek Canyoning. After taking a ride in a 4×4 jeep to the start of the trail, you get to rappel down a series of 4 waterfalls ranging in height from 45 feet to 165 feet! Rappelling down a smaller waterfall. While I’ve tried rock climbing and rappelling before, it was an amazing experience to rappel down waterfalls and land in the small pools of water at the bottom. Definitely a thrill that tested my fear of heights! Costa Rica has a plethora of volcanos, some of which you can hike. I did a hike in Arenal National Park, which is home to two volcanos: Cerro Chato Volcano and Arenal Volcano, both located near the town of La Fortuna. My hike took me up Cerro Chato, which had its last eruption almost 3500 years ago and is considered to be extinct. This particular volcano has a crater lake at its summit where you can go swimming. 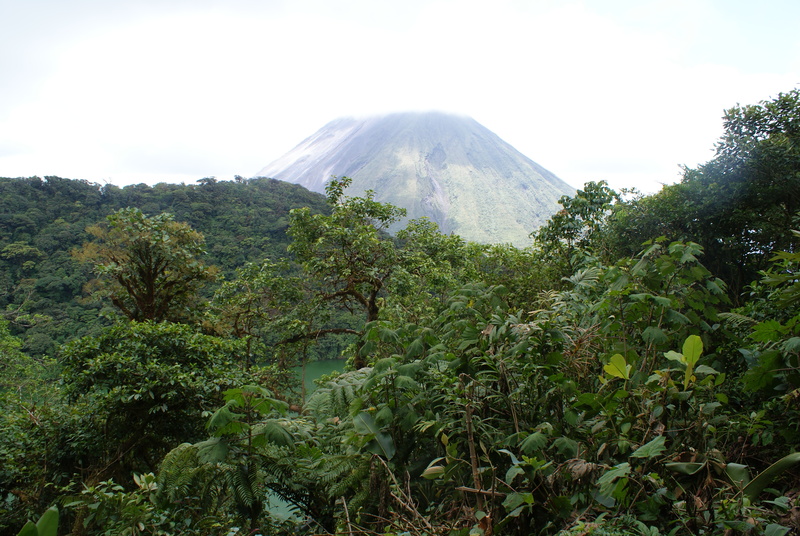 Looking up you’ll find Cerro Chato’s big brother, Arenal, which last erupted in 2010. View of cloud covered Arenal Volcano and Cerro Chato’s crater lake. Volcano hiking can be done all over Costa Rica. Some hikes are simple, short walks from the parking lot while others take a full day to conquer. Below is a list of volcanos that you can hike and their height. Most can be done on your own without a guide, though many tour operators will offer guided treks. Yet another great way to explore the Costa Rican jungle while having tons of fun! As I’ve mentioned before, my boyfriend and I are active white water canoeist at home and we love to spend time on the river when we travel. We choose to go rafting down one of Costa Rica’s biggest white water rivers, the Pacuare River (just east of San Jose). There are many rafting companies out there but we went with an absolutely wonderful company called Exploradores Outdoors. They do pick-ups from many different locations around the country and will even drop your off somewhere different after your day on the river. We had a small group with a wonderful guide and thoroughly enjoyed being splashed and bounced around while we navigated through a jungle river. The Pacuare River. Picture courtesy of Exploradores. Rafting the Pacuare River. Picture courtesy of Exploradores. Costa Rica is just brimming with wildlife and you don’t have to go far to find it. That being said, one of the best places to see wildlife is in Tortuguero National Park on the Caribbean ocean. Since Tortugeruo, both the village and the park, are accessible only by plane or boat, there is plenty of wildlife to spot. While checking into our hotel in the park I saw a troop of white headed capuchin monkey’s hanging out and also spotted a caiman sunbathing on a small beach by the water. 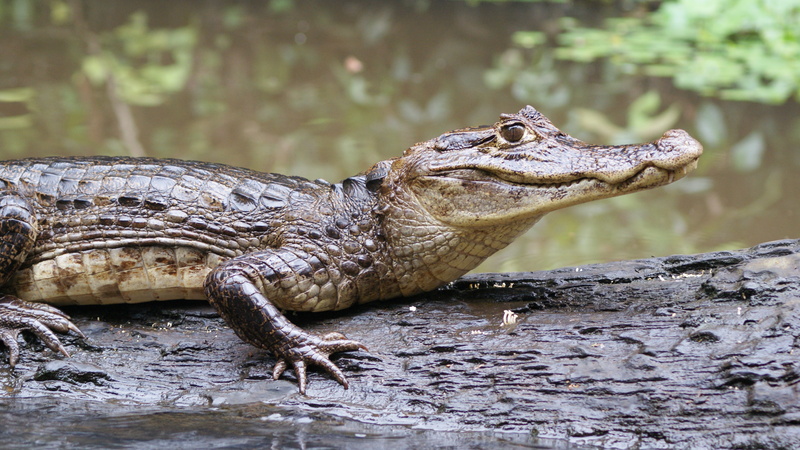 Caiman relaxing on a log. I highly recommend taking an early morning wildlife canoe tour. You’ll get to paddle through the area’s famed mangrove canals while keeping your eyes peeled for iguana’s, caiman, birds, monkey’s and basically anything and everything else that you may find living in the jungle! Tortuguero is also one of the best places in Costa Rica for turtle watching. It’s one of the most important habitats for turtles, as 4 out of the 8 sea turtle species come here to lay eggs. Manuel Antonio National Park on the Pacific Ocean is also reportedly a great place to see wildlife. A great ocean adventure activity that you can do almost anywhere in Costa Rica, provided you’re on one of the coasts. 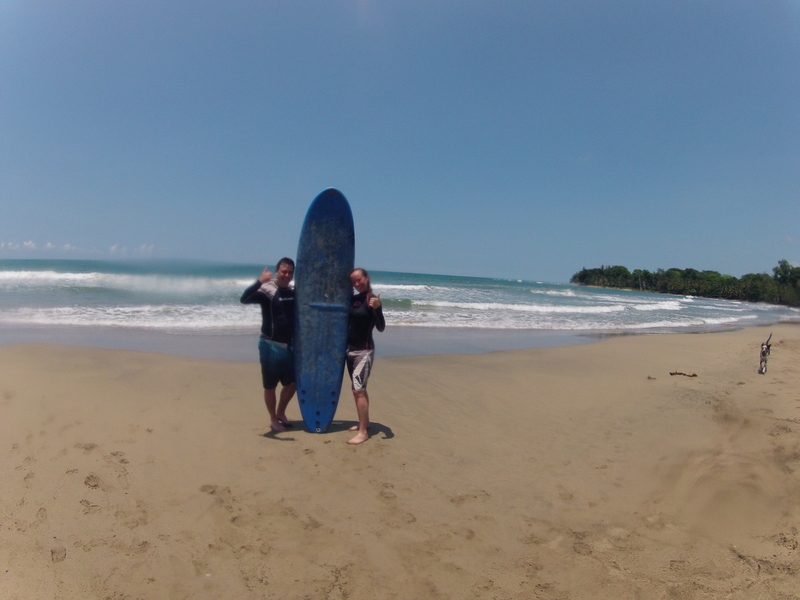 I gave this a try while staying in Puerto Viejo de Talamanca, which is also said to be one of the best spots in Costa Rica to catch some big waves. I signed up for a beginner lesson through my guest house but there are lots of options for surf schools all over Costa Rica. Another reportedly great area to go surfing, especially for those with experience, is to head to the Pacific coast in the area of Playa Grande and Playa Tamarindo. There are many other adventure activities that you can do in Costa Rica! I just simply didn’t have enough time to do them all. Like this article? Pin me! Hi I'm Jill! I'm a part-time world traveler and full-time adventurer living in Ottawa, Canada. I'm a travel addict, adrenaline junkie, lover of the outdoors and world explorer. I was born with Wanderlust in my blood and I'm always on the look out for new adventures both at home and abroad. My goal is to inspire others to get out there and live a life of adventure. Remember, "the world was meant to be experienced, not imagined."